Arak can quest for hours in trance, his mind far away. He's different, a worthless dreamer, tormented by other young dragons. Finally Arak leaves the clan, flying far over the sea and crashes on a remote ice floe. He suffers serious injuries and the loss of his trance-stone. A fearless, shape-shifting octopus named Scree finds and heals him, and an unexpected friendship begins. 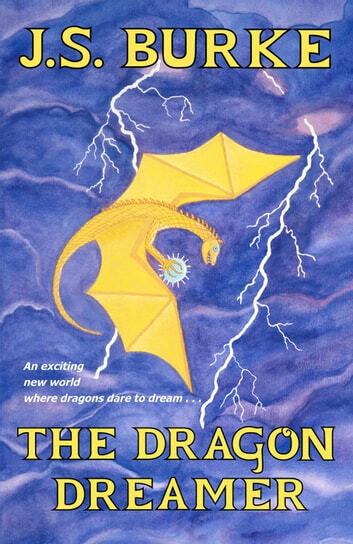 The Dragon Dreamer is an upbeat science fantasy adventure with flying dragons, an undersea world, and unexpected friendship. This young adult story has an illustration for each chapter; it's layered for readers age 8 to adult. The Dragon Dreamer was a lovely book to read. I really enjoyed it. Jenny has a way of making the creatures come to life. This book is a must for those who love dragons and wonder about the fabulous creatures that live in the seas. Action, Adventure, and Romance. What more could you ask for? At first you would wonder how octopus and a dragon could be brought together. Jenny Burke not only does this but also other species who by seeing past their differences and finding common ground and respect find strength and friendship. With the open mindedness of just one can cause in this case waves that ripple throughout an ocean. The vibrant sometimes dangerous world brings forth the need to mesh each other’s abilities together for the betterment of all. Look forward to re entering this world again. Arak is a dragon, but he's not like the other dragons. He has a gift that makes him different, and being different is never easy. Wanting to gain acceptance among the other dragons, he sets off on his own to try to help his people and ends up in trouble. Which is when he meets Scree and a beautiful friendship is born. Will these two exceptional individuals overcome all the challenges ahead and succeed in helping their people? You'll have to read to find out! I loved, loved, loved this story. I literally couldn't put it down and ended up reading through the night. It's not a terribly long book, but it's chocked full of important themes and thoughtful interactions between the characters. Virtues like tolerance, patience, cooperation, empathy, kindness, and open-mindedness are emphasized and celebrated. The characters solve problems by working together and using their differences to complement each other. And, as someone who revels in "exploring" new worlds, the world-building in this book is outstanding. The imagery used to paint a picture of two different worlds, one above the water and the other underneath, is breathtaking. I think this book is perfect for anyone from age 8 to 108 and I can't recommend it enough.